« Fuel Tax Increases In California, Now Highest In U.S.
As gas stations across the country get ready to roll out gasoline blended with 15 percent ethanol – and as the EPA has begun to recommend increasing the ethanol content in fuel to 30 percent – the Antique Automobile Club of America, one of the largest collector car clubs in the country, has come out in opposition to any mandate that places ethanol in automotive fuel. Cox and several other AACA members joined representatives from the American Motorcyclists Association and the Specialty Equipment Market Association’s SEMA Action Network (which has also recently vocalized its concerns regarding ethanol in fuel) last Wednesday in traveling to the Capitol in Washington, D.C., to rally in protest against ethanol-blended gasoline. 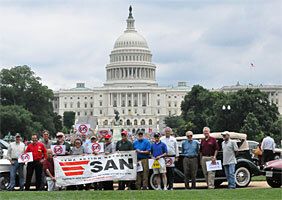 During the rally, the AACA members parked their cars on the National Mall and met with members of the Congressional Automotive Performance and Motorsports Caucus, some of whom spoke out against the use of ethanol in fuel. According to Cox, while the AACA has been and remains to be careful to keep out of the political aspects of the issue – as a 501(c)(3) non-profit, the IRS prevents it from lobbying or endorsing political candidates – seeing the effects of ethanol-blended fuel use in collector cars, particularly on AACA tours, has motivated AACA leadership to take more of a stand in recent years. Cox said that, as a non-profit, the AACA can, and is expected to engage in, educational efforts, so it has undertaken to educate its 62,000 members – and the elected members of the government – about the effects of ethanol on older cars. 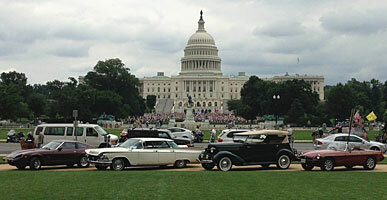 In addition to the rally, the AACA also printed a pair of editorials arguing against ethanol-blended fuel in the May/June issue of the club’s magazine, Antique Automobile. At the federal level, two pieces of legislation introduced in Congress earlier this year – House Bill 875 and Senate Bill 344 – asked the EPA to suspend the sale of E15 until the fuel could be studied further. Both of those bills remain in committee. However, at least two states have rejected ethanol-blended fuel mandates. Earlier this month, Florida Governor Rick Scott signed into law a bill (HB4001) that repealed existing Florida legislation that required up to 10 percent ethanol in fuel. Late last month, Maine Governor Paul LePage signed into law a bill (LD 115) that banned all ethanol-blended fuels from sale in the state as long as at least two other New England states followed suit. Cox said that he believes the rally last week built awareness of the issue, but it also showed that a diversity of automotive organizations (AACA has long been known as catering to the restoration crowd, while SEMA has long been known as catering to the hot rodding and customizing crowd) can come together to speak out on the issue. UPDATE: We also learned this morning, through Automotive News, that an Alliance of Automobile Manufacturers lawsuit to block the sale of E15 was denied by the U.S. Supreme Court.